It was important to me that all guests at my wedding be able to follow the ceremony. 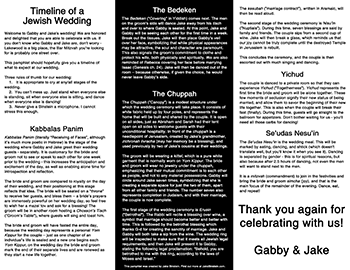 Jewish weddings have many stages, each with deep metaphors and symbolism. I created a pamphlet to give out to my guests, and received so many requests for the original file that I posted it here so that others can benefit from it. Although I’ve made dozens of websites and web applications, this is one that I’m most proud of. 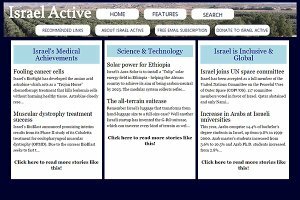 I had contacted Michael Ordman, who runs “Good News From Israel“, with the intention of creating a database that to hold each of the positive stories about Israel that he’s collected over the years. It turns out that the database now holds over 8,000 such stories. Most blog sites are easy to mock up with tools like WordPress, but a site with that many posts came with a host of optimization issues. Making sure that the site remained performant and fast to respond required me to do some deep research into database query optimizations and caching. Creating the site involved organizing, standardizing, and editing the manuscript images sent to us, as well as the transcriptions and translations for each image. Each image also had to have its source and call number available to the reader. 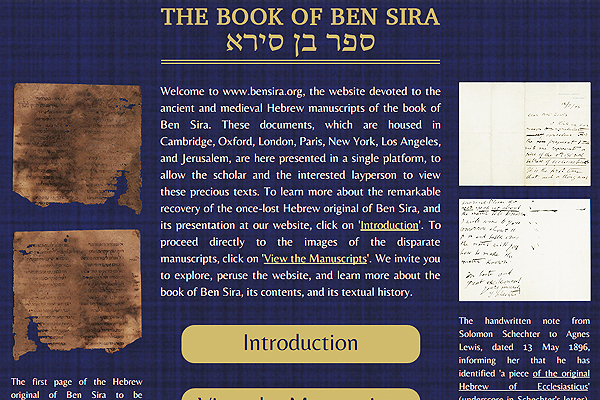 Finally, the site had to be optimized for search engines – it now is the second result for “Ben Sira” searches, behind only Wikipedia. The project has been cited numerous times in both books and scholarly articles. 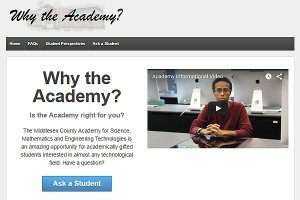 Frustrated by the lack of information and advertising surrounding the technical high school that I went to, a friend and I created a website to show off our beloved school and encourage prospective students to check it out. Since creating the site, it has become the main source for curious students and their parents. Our hope is to vastly increase the number of applicants to the school, and given the number of graduates who have gone on to the Ivy Leagues in recent years, we like to think that we’ve had a hand in that success. Throughout my college career and beyond, I took on a number of pro-Israel causes. 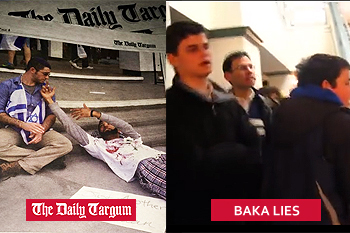 One project that I believe had deep impact was “BAKA Lies” – an anti-Israel group on campus attempted to bar Jews from entering an event that claimed that the situation in Gaza is worse than the Holocaust. After recording the event and providing a writeup both on my website and to the Rutgers administration, the group was forcefully disbanded, and several of the outside organizations with which they co-sponsored the event were banned from the campus. Another project that was very important to me was the Daily Targum Bias tracking. Our campus newspaper’s anti-Israel Opinions Editor had a nasty habit of making ridiculous changes to Jewish and pro-Israel editorials before publishing them. By tracking each change and publicizing them, I was able to shed light on what would otherwise have gone unnoticed. By calling out these edits as unacceptable, the newspaper was forced to respond and institute actual journalistic ethics.